I’ve been all about eyeshadow & lipliners lately…& today I get to show you some new favorites! Beauty ADDICTS is a line that is new to me but I’m quite impressed with the 4 products I’ve tried so far…& really love the looks I’ve created! Keep reading to check out my makeup look & thoughts! The 4 products I have to show you are relatively natural looking- but seriously pretty! Lately I’ve been wearing lipliner again…does anyone else go through lipliner phases? I definitely do! 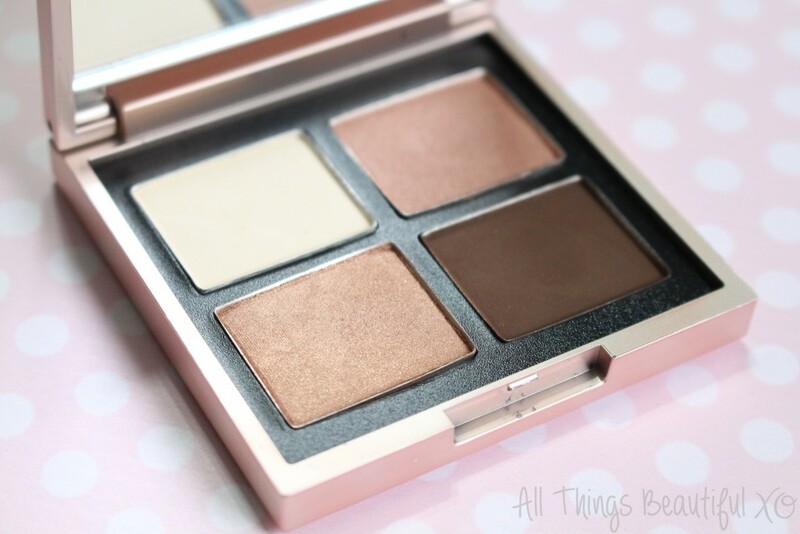 I’ve also been semi-obsessed with rose gold…& this quad is seriously gorgeous. Beauty ADDICTS Solution Eyes Eyeshadow Quad in Glow- A natural-leaning quad with 2 matte shades, one shimmer, & one metallic housed in fair rose gold packaging. Beauty ADDICTS Effortless Eyes Eyeliner in Seduce- A triangle-shaped pencil (yep! triangle!) in a black pencil. 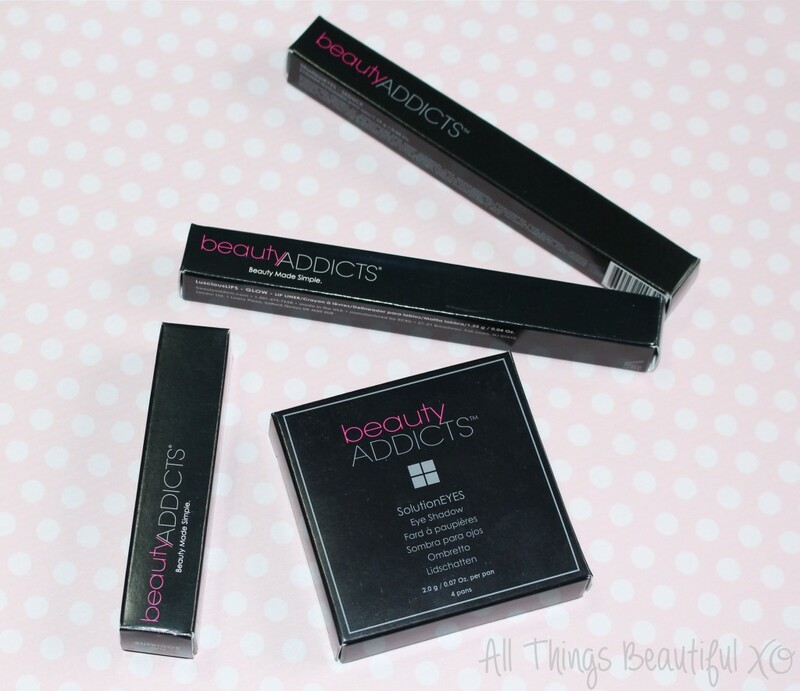 Beauty ADDICTS Lip Addiction Lip Gloss in Socialite- Creamy pink lipgloss with a doefoot applicator. Beauty ADDICTS Luscious Lips Lipliner in Glow- A natural looking peachy pink automatic lipliner pencil. I want to show you the Beauty ADDICTS Solution Eyes Eyeshadow Quad in Glow a bit more closely since I think it is quite unique. It is rare that I come across a quad from a new brand that contains not one but TWO matte shades! The one issue I have is that it is kind of hard to get open, I wedge a bobby pin in the opening to get the lid up when I’m using it. 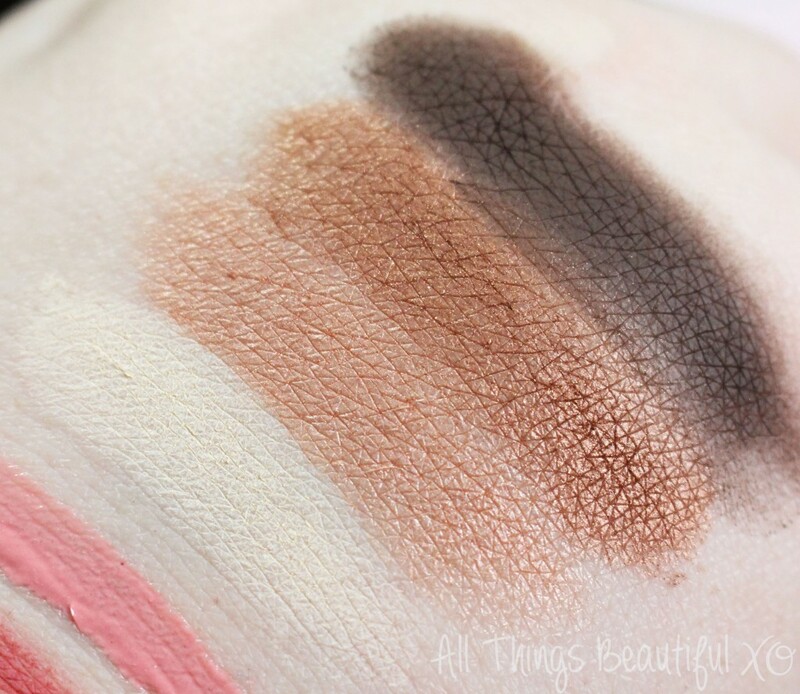 See swatches of these shades below! On the top left we have a matte white-toned vanilla, to the right we have a soft shimmering rose gold. On the next row starting on the left we have a semi-metallic bronze & next to that a deep chocolate dark brown. My swatches are in order from left to right as stated here. From left to right here we have the Beauty ADDICTS Effortless Eyes Eyeliner in Seduce, Beauty ADDICTS Luscious Lips Lipliner in Glow, & Beauty ADDICTS Lip Addiction Lip Gloss in Socialite. This is the first time I’ve enjoyed using a traditional eyeliner pencil in a very long time! I really love how easy it is to make smoky as well. I’m totally in love with this lipliner- it doesn’t tug & the peach-toned pink is just so wearable. In the photos I’m only wearing the lipliner by the way! The glossy is a strawberry milkshake shade with a soft pink shimmer. It is really pigmented & comfortable as well. Swatches left to right: Beauty ADDICTS Effortless Eyes Eyeliner in Seduce, Beauty ADDICTS Luscious Lips Lipliner in Glow, Beauty ADDICTS Lip Addiction Lip Gloss in Socialite, & the Beauty ADDICTS Solution Eyes Eyeshadow Quad in Glow. For my eye look I have used all 4 shades in the quad. I focused the rose gold shade all over the lid & inner corner then the bronze more in the crease & outter half. The dark brown is in my outter corner blended out & the vanilla shade I used for blending a bit & under my browbone. 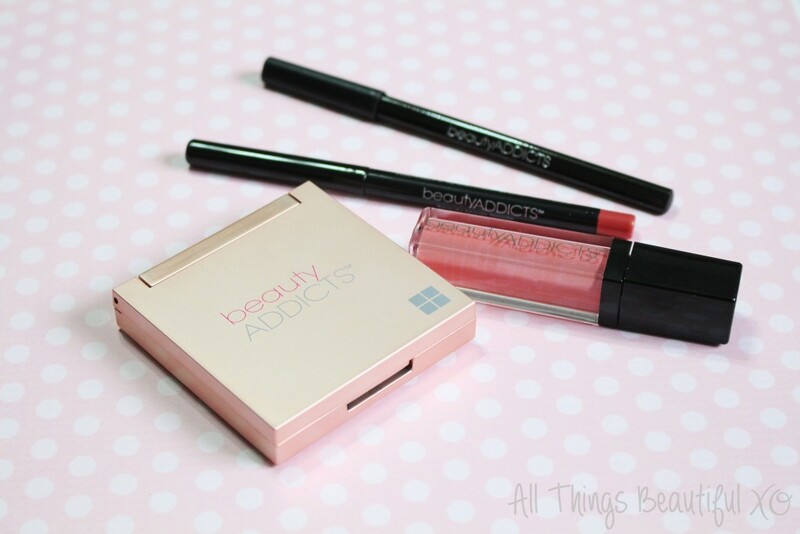 Have you tried any products from Beauty ADDICTS? Anything here catch your eye? I told you I’ve been a bit obsessed with rose gold- any colors really appealing to you lately? Tell me about it in the comments!